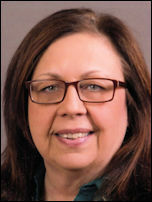 Rep. Gina Mason, a first-term state representative and the mother of Maine Senate Majority Leader Garrett Mason, died suddenly Tuesday. Gina Mason, who was 57, owned Rick Mason Excavation in Lisbon and served in a number of elective positions in that town before running for the Legislature in 2016 to succeed her cousin, Rep. Dale Crafts, who could not seek re-election because of term limits. She served on the Lisbon Town Council and Lisbon School Committee and was named 2010 Maine Public Official of the Year by the Maine Development Foundation and Maine Downtown Center, according to her legislative biography. In the Maine House, she served on the Inland Fisheries and Wildlife Committee. Gina Mason also was survived by her husband, Rick, and her daughter, Haley. Condolences for the family were pouring in via social media Tuesday and Wednesday. Rep. Richard Campbell, R-Orrington, who has known Mason for many years, referred to her as “the loveliest lady, so caring,” in a Facebook post. Garrett Mason announced Monday that he’d kick off his campaign to seek the Republican nomination for governor in 2018 on Wednesday, but his Lewiston event was canceled after his mother’s death. Under Maine law, Gov. Paul LePage can call a special election to fill a vacancy in the Maine House if municipal officers in an affected town tell him that there’s a need to fill it before the next general election. However, Maine has a general election set for November. The cause of Gina Mason’s death had not been made public by late Wednesday afternoon.